This blog describes how to setup secure connections to sftp servers in the cloud integration system. It gives a step by step description what needs to be configured where. Furthermore, test options are described for testing sftp connectivity. A typical task in an integration project is to connect sftp servers to the SAP Cloud Integration Tenant, either for sending messages to or for polling messages from the sftp server. Before going into detailed configuration of the communication lets first have a short look at the basics. The sftp server can act either as a sender or a receiver of messages. The setup and the detailed configuration procedure differ according to the communication direction that is being set up: whether the sftp server is supposed to provide messages to the integration platform or the other way round. For more detailed information about sftp communication in CPI refer to SAP Documentation chapter ‘How sftp works’. The polling sftp scenario and which security artifacts are involved is described in SAP Documentation chapter ‘Inbound sftp with Public Key Authentication’. For secure SSH communication a known hosts file has to be deployed in the cloud integration tenant containing the public host key of the sftp server so that the sftp server will be trusted. Furthermore, for public key authentication with the sftp server, a private key has to be maintained in the cloud integration tenant keystore. Also User/Password can be used instead, in this case user credentials have to be deployed in the cloud integration tenant. Recommended configuration option for secure communication is public key authentication. If you want to configure the connection to an on-premise sftp server via Cloud Connector refer to the blog How to Connect to an on-premise sftp Server via Cloud Connector. For SSH based communication, the cloud integration tenant needs the host key of the sftp server, which has to be added to the known hosts file and deployed on the cloud integration tenant in the next step. The host key can either be downloaded from sftp server or has to be provided by the administrator of the sftp server. Normally the public key of the sftp server is contained in the .ssh directory with the name id_rsa.pub. To communicate with the sftp server an user account needs to exist on the sftp server. The user name is needed in CPI to connect to the sftp server and has to be provided by the administrator of the sftp server. The user must have sufficient authorization to create/move/delete files on the sftp server. For SSH based communication in the cloud integration tenant, the public host key of the sftp server provided in previous step is needed in the cloud integration tenant. Furthermore, for using public key authentication towards the sftp server, a private key pair with the alias id_rsa or id_dsa is required in the cloud integration tenant’s keystore. You need to add the sftp host key you received in previous step to the known hosts file deployed in your cloud integration tenant. For this download the file from Manage Security Material view available in the Operations View in Web in section Manage Security. If no knwon_hosts file is deployed yet on the tenant you have to create it as described below. Open the file with notepad or some other text editor and add the host key of the sftp server. If no known_hosts file was deployed create it. Deploy the known_hosts file in the Manage Security Material view available in the Operations View in Web via the Add -> Known Hosts (SSH) action. Browse the known_hosts file and deploy it. As explained above, for public key authentication a private key pair needs to be maintained in the cloud integration tenant keystore. In Keystore Monitor available in the Operations View in Web in section Manage Security check, if there is already an entry with the alias id_rsa, id_dsa or id_ecdsa available. If so, you may use it and skip the next two steps, continue with download of the public key. 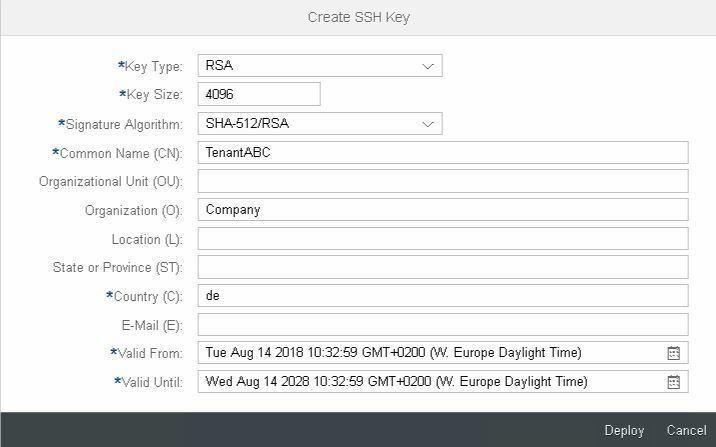 With the 02-September-2018 update, in the Keystore Monitor you can directly create SSH keys. There is no need anymore to use an external tool for this. To create the SSH Key open the Keystore Monitor available in the Operations View in Web in section Manage Security. All certificates and private key pairs contained in the tenant keystore are shown. Choose Create -> SSH Key to create a key pair for the sftp connectivity. Select Deploy to create the key. If a key with the respective alias already exists, an error message is given. In this case you may use the existing one for your scenario or use a different Key Type or rename the existing alias. You should not share a private SSH key. Each CPI tenant (e.g. test tenant and productive tenant) should have their own SSH key, the same applies to each natural person (e.g. developer, administrator or consultant) who needs access to the SFTP server. This way access to a specific SFTP mailbox can be granted and revoked to each system and each person separately. You should not use username/password authentication to SFTP servers. Once you have configured multiple systems to access a mailbox via username/password authentication, it becomes very hard to change this password again, because you must change it synchronously on the SFTP server and all involved systems, which are at least two (one writing to the mailbox and one reading from it). Furthermore, you may need to share this password with administrators and maybe even integration flow developers or external consultants involved in the set-up of the scenario. Once you have shared the password, you cannot make anyone to forget it again, so to remain secure, you would have to change it each time someone leaves the project, which is difficult and error-prone as stated above. For public key authentication at the sftp server the public key of the cloud integration tenants private key (id_rsa or id_dsa) is needed in the sftp server. For this, export the public key of the private id_rsa/id_dsa key pair in the Keystore Monitor. You can export either the X.509 certificate or the public key in OpenSSH format; choose the format your sftp server supports. This option is available as single line option, select Download Certificate or Download Public OpenSSH Key from the actions Button in the line of the id_rsa/id_dsa/id_ecdsa private Key Pair. Download Public OpenSSH Key will create an <alias>.pub file in the download directory. The file contains the public key in openSSH format, which can be used to be put to the sftp server. Download Certificate will create a file with the name <alias>.cer in the download directory. This X.509 certificate file can be imported to sftp server, if the sftp server supports the format. For public key authentication, in the sftp server the public key of the cloud integration tenant’s private key needs to be imported. Provide the downloaded public key to the administrator of the sftp server, so that he can add it there. On an OpenSSH server it’s done via adding it to the authorized_keys file in the .ssh directory. With this last step the configuration of the communication to the sftp server using public key authentication is completed. You can now use public key authentication in sftp sender and receiver channels. To test the connectivity, continue as described below. After setting up the connection toward the sftp server, the connectivity test feature can be used to test the communication or even to download public keys. The Connectivity Test is available in Operations View in Web, in section Manage Security Material. Selecting the Connectivity Test tile from Overview Page will open the test tool offering tests for different protocols. To test the communication to the sftp server, the SSH option is to be selected. To test the connection with host key and public key check, select Authentication option Public Key and enter the address of your sftp server, and the user name available in the sftp server and execute the test. The test will give a success message or an error with detailed error information. If there is an error with the SSH connectivity (e.g. reject HostKey) it is possible to execute the test without the option Check Host Key. In this case the sftp host key is not checked, but it can be copied via Copy Host Key Button and added to the known hosts file as described in the above chapter. Make sure the fingerprint of the downloaded host key is checked with the administrator of the sftp server. The public key authentication is checked via the authentication option Public Key. The authentication is done with the id_rsa/id_dsa key with the user entered in User Name. If there is an authentication error you get an Auth fail error. In this case either the id_rsa/id_dsa alias is not available in keystore, the public key was not added to the sftp server authorized keys correctly or the user is not valid. If everything is setup correctly you will get a success message with Check Host Key using Public Key Authentication. is there a way to connect an sFTP Host which is located on Prem via SAP Cloud Connector? I’m especially thinking about the new option to use TCP / TCP (SSL) for connection. If not, are there plans to do so? I would think this requirement might be quite common for integration customers. it’s not possible yet, but it’s planned. We will enable this mid term. This is possible now, see blog How to connect to an on-premise sftp server via Cloud Connector. I see in the SSH Connectivity Test there is an option for Authentication: None. Does setting this option mean you are just pinging the SFTP sever? The SSH test tries to establish a SSH connection to the SFTP server, but does not authenticate. Hope you are doing well. I have worked on sFTP servers which is managed by SAP. But out customer have sFTP server inside their secured zone. In this case IP/host name of the server should be public? Which means reverse-proxy is a mandatory so that HCI can reach the sFTP server? It is planned to offer a connection via cloud connector, but this is not available yet. Currently the sftp server needs to be opened to the internet to be connected via cloud integration. Thconnection via CC is possible now, see blog How to connect to an on-premise sftp server via Cloud Connector. we are trying to use .ppk file sent by ADP Payroll (everytime they send it and we ask for plain password) but we can’t use it. On HCI / CPI SFTP Adapter we can’t use it, could you integrate this good guide with passages for use putty private key sent by sftp server admins? We tried a lot of guides online but we didn’t find a solution, there is some plane to improve SFTP Adapter with this kind of keys? We will discuss internally if we can offer a more user friendly option to get this imported to the keystore. Like Federico, I too am trying to use the .ppk file to authenticate against an SFTP. The steps given by you have been extremely useful. I followed the steps to convert the putty key to openssh key and generate p12 key pair and then added the key pair to the keystore. Having done this, how can I successfully authenticate against the SFTP using the added key pair? Any suggestions would be greatly appreciated. important is that the alias of the key imported into the keystore is id_rsa or id_dsa (depending on the key type). Only those two aliases are used to connect to the sftp server. Then you can use the ssh connectivity test to test the connection to the sftp server. Thank you replying. How would this work with authenticating against multiple SFTP servers each having its own private key? HCI allows only one alias with id_rsa. you are right, currently Cloud Integration allows only two aliases for sftp connectivity depending on the key type – id_dsa and id_rsa. Usually the private key is generated by the server (function generate SSH key), which is in this case the Cloud Integration tenant. And the public certificate for the key is downloaded and passed to all connected sftp servers. With this you can connect multiple sftp servers. But currently it is not possible to have multiple SSH keys for connecting to the sftp servers. It is on the roadmap, but not for the near future.